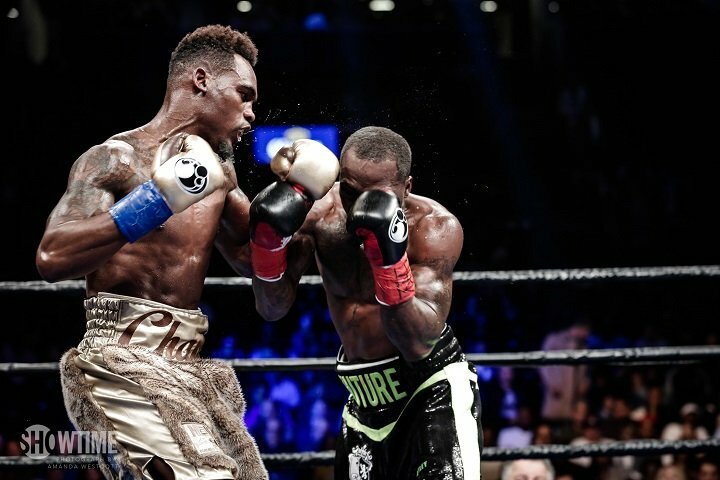 By Jeff Aranow: Showing off his new punching power, WBC World super welterweight champion Jermell “Iron Man” Charlo (29-0, 14 KOs) knocked out his #1 WBC mandatory challenger Charles Hatley (26-2-1, 18 KOs) in the 6th round on Saturday night on Showtime Championship Boxing, presented by Premier Boxing Champions at the Barclays Center in Brooklyn, New York. The 26-year-old Charlo hurt Hatley with a series of big power shots in round 6 and then knocked him out with a crunching right hand to the head. Hatley, 31, went down hard on his side on the canvas for a long time before he eventually was able to get back to his feet. Jermell also knocked Hatley down in round 3 with a left-right combination. The right hand that dropped Hatley was a really hard shot that he had little time to react to. “I knew Charles is a warrior and would get back up,” said Jermell after the fight. “I knew I had to be a lion. They got a guy Jarrett Hurd that took my brother’s title. We can unify,” said Jermell. Jermell Charlo was nailing Hatley with right hands and stiff jabs throughout the fight. Hatley took some major shots. Hatley was able to connect with some nice punches as well, but he wasn’t busy enough or big enough to give Jermell a lot of problems. In round 2, Charlo hit Hatley with a powerful right hand late in the round that sent him flying across the ring into the ropes. The referee Harvey Dock chose not to score it as a knockdown, even the ropes held him up. It was a solid shot that Hatley was hit with. Charlo was cut over his left eye from a clash of heads in the round. By round 4, Charlo was hitting Hatley nearly at will with single power shots. Charlo landed a big right uppercut late in the round that snapped Hatley’s head back violently. He took the shot, but it was a devastating one. It was obvious at that point that Hatley wasn’t going to last too much longer given the punishment that he was taking. The win for Jermell showed that his punching power is getting better. He came into the fight with just 13 knockouts in his 28 wins. Jermell has sparring a lot with unbeaten welterweight contender Errol Spence Jr., who is a big puncher, and that work seems to have paid off in making him a better puncher. Jermell’s trainer Derrick James also needs to be given a ton of credit for increasing his power.